One of our events this week was a hog roast in Warrington for John’s 50th birthday celebration. This was tied into bonfire night and we had some amazing fireworks to enjoy after the event! The day started really early, around 8 a.m.
We collected the hog early in the morning and we drove to Warrington. On our arrival, we were greeted by lovely John and his beautiful wife, Amelia. Our team arrived earlier than planned, around 10 a.m.
After a lovely cup of coffee we set to work and soon had the gazebo up and hog roasting, (read more about it here: http://smokinjoeshogroasts.com/equipment-hire/4586904581) not to mention the tables dressed and lights up and ready for the evening. When we cater hog roast events we provide everything needed to make your party perfect. With the hog roasting away for around 9 hours the aromas soon fill the air and have all the children around looking in amazement at, we also soon have the hog given a name, in this case “peppa”. With the hog slowly roasting, we set to work preparing all the tasty and fresh salads, fresh sauces, chilli, barbecue and very tasty apple sauce all being made on site. John and Amelia had some special requests for our catering team. Some of their guests were vegetarian and they wanted to make them happy with the choices of food available. We wanted everyone to be happy with the food that is served. So we made some delicious roasted vegetables and home made quiche. The guests started arriving around 4 p.m and the hog was an instant draw. It really is a great spectacle. 7pm now and hog and fresh salads were prepared and ready to be served! 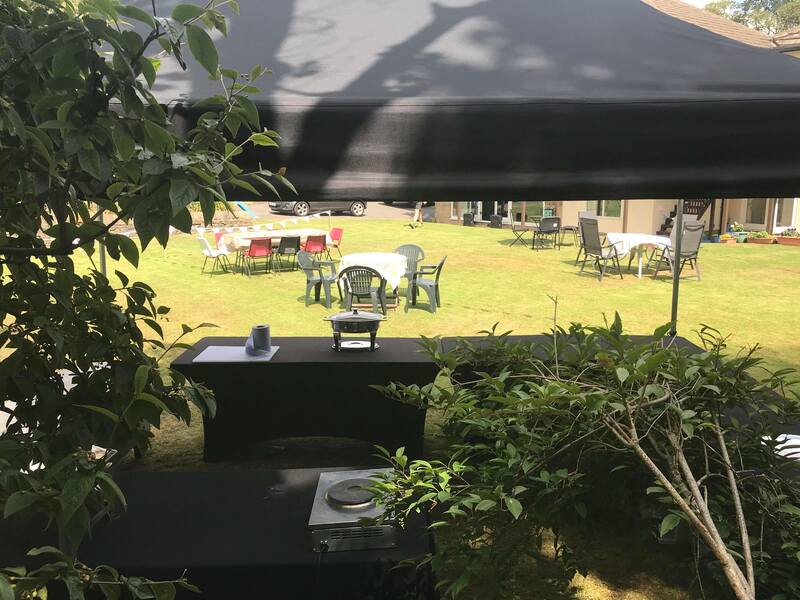 It really is a pleasure to see the guests delight in the hog roast and watch them as they relax in conversation whilst enjoying the meal and the fantastic atmosphere. The music was there too – John and Amelia had this amazing singer that really made the experience even more special. Once the hog was served, after seconds and even thirds in some cases (Dean & Graham) we then start slowly and discreetly packing away the equipment. With a quick thank you hug from Amelia and firm handshake from John with a promise of future events we then leave and head back to base feeling as satisfied as the guests them selves. Hog Roast catering is an absolute pleasure to be involved with and events like this strongly reassure them feelings. Previous Previous post: Why Should You Hire Catering For Your Function?